The famed Royal yacht, Britannia, is the pride of the Ocean Terminal in the port of Leith, Edinburgh's recently developed waterfront shopping and leisure area. Numerous illustrious passengers, including Sir Winston Churchill and Nelson Mandela, have trod her decks, not to mention the British Royal Family themselves, who used the ship for 40 years. Now visitors can board this vessel on a self-guided audio tour (available in 22 languages), cruising through the fabulous state apartments, the crew's quarters and the gleaming, polished engine room. Most of the accoutrements on board are original, and there are some surprises too: like the Queen's bedroom and one of her shiny Rolls Royces. A number of framed photographs of the Royal Family on board the ship make the visit seem all the more intimate. At the Visitor Centre, you can learn about celebrity life on this luxury ship, and browse through the souvenir shop. Having a bite to eat, or at least something to drink in the tearoom is a must. 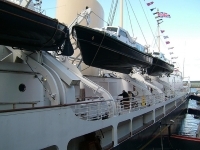 The Royal Yacht Britannia is the top attraction in the country according to VisitScotland, and the tour consistently receives rave reviews from tourists. Opening times: 10am to 3.30pm (January to March); 9.30am to 4pm (April to June); 9.30am to 4.30pm (July to September); 9.30am to 4pm (October); 10am to 3.30pm (November to December). Admission: £12 (adults), £7.50 (children aged 5-17), free for children under 5. Concessions are available.